The MKG-Minnesota Kali Group of schools are truly an international network with affiliates and branches throughout the world including England, Japan, Spain, Scotland, Germany and the United States. The mission of the MKG schools has always been to offer qualified instruction in high quality and highly effective martial arts without an emphasis on competition or ego. Our motto is Learn.Play.Sweat. MKG Martial Arts International, the Seattle Branch of the world famous Minnesota Kali Group, opened its doors in 2000. Our 24,000 square school is located in the Northgate neighborhood of Seattle and is one of the largest schools of it’s type in the country. Parking is never an issue as we have an extremely large parking lot and a bus stop 1 block away. Complete Studio Fully Equipped For Fitness Classes With Medicine Balls, Bands, Kettlebells and More. That has three distinct programs or combine them! MKG Seattle strives to be on the cutting edge of martial arts and fitness in our four completely distinct programs. Adult Martial Arts and Kickboxing, cross cultural Youth Martial Arts, CrossFit @ MKG and our MAX10 Kickboxing Bootcamp Challenge, formerly called 10 Week Body Sculpt Challenge. To the left, you will find a full tour of our facility conducted in March of 2014. In the video you will see all 5 training floors being used simultaneously as well as highlights of the facility. We are excited to meet you! 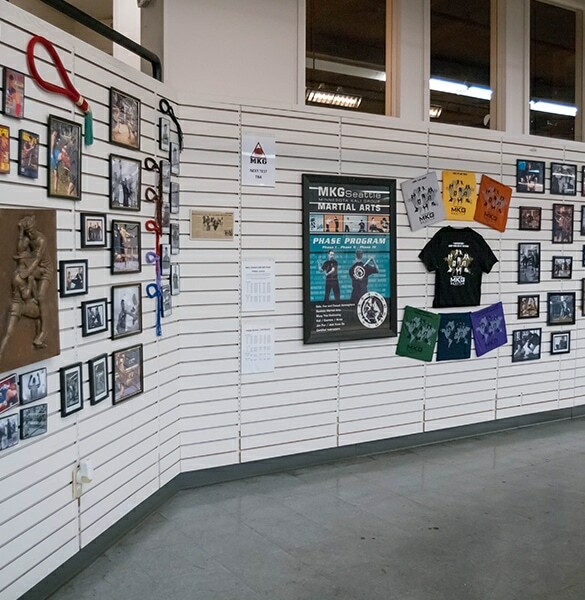 With 40 YEARS of history the MKG, Minnesota Kali Group, family of schools have used the best in martial arts, combat sports and combat fitness to improve peoples lives. With individuals from absolute beginner to advanced level, from 4 years of age to over 60, training in our split classroom format you will find the program that fits your needs. Whether it is our Kid’s ‘ Karate ‘, Black Belt Martial Arts, ADULT Martial Art Crosstraining / Seattle Kickboxing Program or our proprietary MAX FITNESS programs and bootcamps we have it all. No matter what your interest may be – martial arts, fitness, self-defense or stress reduction – our programs and classes focus on personal improvement at your own pace, with the support you need to reach your goals. MKG is not a gym, it is a martial arts school. You can get a work out and hit or kick a heavy bag anywhere. But if you really want to LEARN martial arts and immerse yourself in multiple art forms, then you owe it to yourself to give MKG a try. I took my first Phase/Mixed Arts class at MKG about 8 years ago and have been enrolled at the school since. I consider the students and instructors at MKG some of my dearest friends, more like a part of my extended family. The sense of community is second to none. In addition to the adult and youth martial arts programs, the school also offers the MAX10 Fitness & Boot Camp and a state-of-the-art CrossFit program. There is also very reasonably priced child care available on-site.